Club car DS clutch problem? Seeking help from experts. 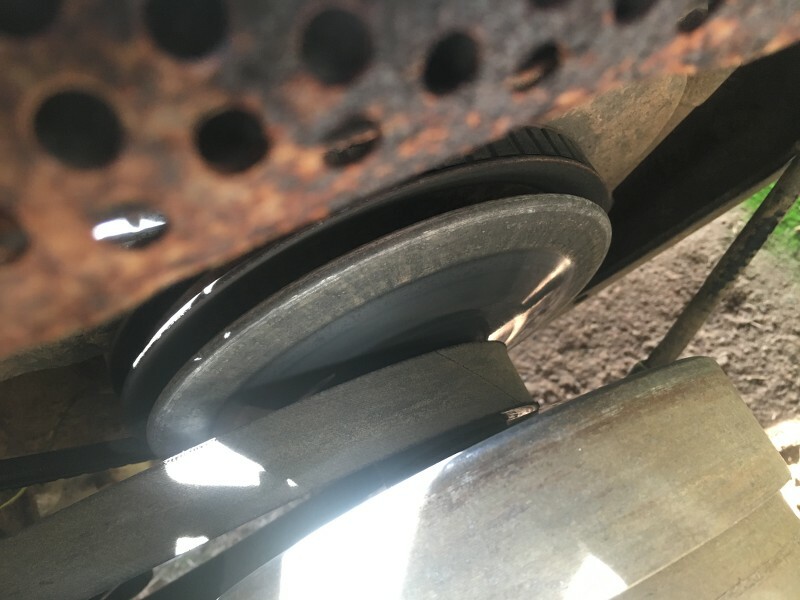 I have a 2001 club car and the clutch engages fine but I noticed the belt is not riding up all the way on the driven clutch. Also the belt is in rough shape (cracked), what service is recommended to get the clutch to operate properly and get my my best top speed. I have a picture but can't get it to upload from my phone without it being huge, the belt stays about an inch and a half from the top/outside edge of plates of the clutch once it "rides" up to the top speed position. Thank you all, I am sure it is a spring or something that has fatigued. Re: Club car DS clutch problem? Seeking help from experts. It'll be a great investment, and improvment! I am going to start there anyways, and yes the Cart Parts Plus severe duty belt was definitely on my mine but will mull over that decision in the mean time. Here is a picture of how high the belt rides up which looks to me like the clutch is not fully operational. Of course the shiny part is where it has been riding. This is a video of it in maintenance mode, when it cuts out it is bumping the rev limiter so it should have slung out farther I think or does this look correct. I am going to replace the belt anyway but if it still does this afterwards I need to know where to start. that belt is toast,it is visibly worn thin! More than likely the clutch needs replaced. Engine RPM is running too high, so its banging the rev limiter. I will start with the belt and go from there, hopefully the clutch isn't toast. It works fine as is it is with the horrible belt. It just doesn't have the top end I thought it should. And if the belt was wider it would be up all the way on the clutch. Now for the next question, is the severe duty belt worth it?? Any real world reviews with big tires?? A new fat and juicy belt will hook that clutch up. Thank you and yeah if the clutch fails the motor will probably come out with it. I've had the severe duty belt on my cart for about 6 years with almost NO wear! That's my .02 on that one! OR... the belt is just a 2nd replacement, and it's SO worn that it just can't get any higher!